A painting named “Side Show” by American pop artist Charles Bell is reproduced below. Bell excels in painting glossy mechanics, such as elaborate slot machines and fancy, classical cars. His approach and the audience have a matter-of-fact mentality, suggesting that “well-established technical solutions and gadgets dominate the sphere of living, together with an enjoyment of popular entertainments of yesterday” (volume 1: p 114). Typically, the characters that Bell depicts in “Side Show” are mechanical dolls. Bell’s painting captures a recurrent event in the life of any societal realm, in this case the realm of art, specifically a musical theatre. The setting is the street outside a theatre. The task, here, is to sell tickets, a necessary economic sideshow to the main artistic show on the stage. A street sign calls out in capital letters to the passersby “Come and See!” A poster illustrates a drummer from the cast. Another actor from the show appears in person working his cymbal, making him heard in the street, and drawing attention to the theatre and its production. This side show attracts the audience to the next performance, the main show. “Side Show.” Photorealism by Charles Bell 1984. Oil on Canvas. Phoenix Art Museum, Arizona. 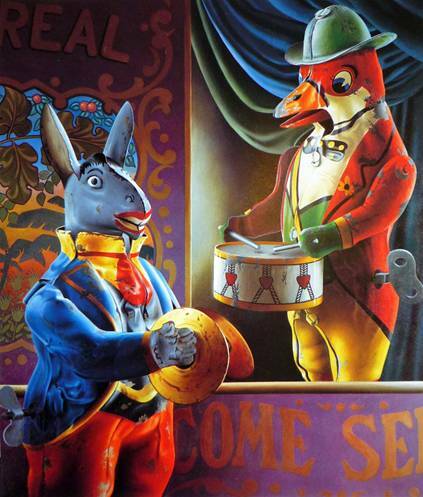 Depicts a poster outside of a theater with a main show (drum) and with a sideshow in the street outside the theater (cymbal) attempting to attract an audience. 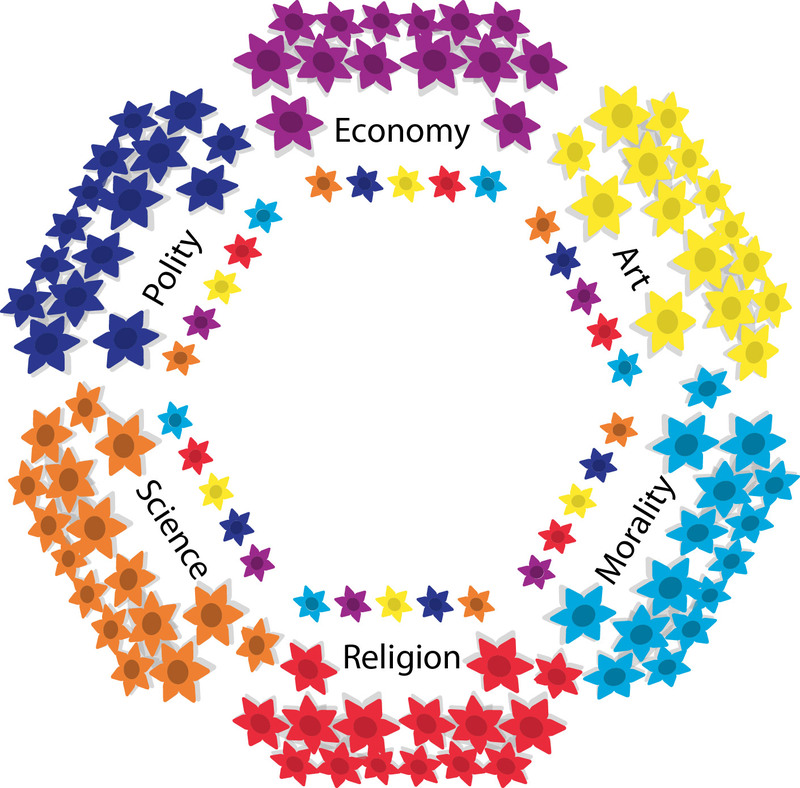 A close look at concrete components of any societal realm – a corporation in the economy, a government agency in the polity, a research institute in science, a congregation in the religious sphere – usually reveals that they contain minor elements from other spheres of life, a phenomenon we might call ‘realm embedding’. The realm cannot function well without these elements. A great deal in modern society cannot work exceedingly well without some money from the economy, some regulations from the polity, certain commandments of morality, and some of knowledge from science. To achieve efficiency, we may also need artistic enhancements in our living environment and in our designs. The meaningfulness that the realm of religion offers to these designs may also add effort to the pursuit of the cardinal values involved. In other words, each societal realm potentially contains side-functions, or what we call sideshows, of all the other realms. The organizations, networks, and media, and other facilities in any of the realms of science, polity, economy, art, religion, and morality, tend to embed smaller elements from the other realms, which assist the given realm in pursuing its cardinal mission, what we could call the main show, that is the creation of knowledge, prosperity, order, beauty, sacredness, or virtue. In the main, business creates and manages wealth, not regulatory systems. Yet business needs political regulations which underpin the commercial contracts of buying and selling, et cetera. Nowadays, business also welcomes an infusion of academic knowledge, which it buys just like any other service or product. Business premises, advertising, and marketing presentations require an artistic hand. Still, all this obviously does not mean that politics, academic knowledge, or art can be reduced to business. The students of a given societal realm must learn to separate what is the main show and what are the sideshows. A main show is comprised of all actions, positions, collectivities, stratifications, rewards, rationalities, et cetera associated with the cardinal value of that specific realm, be it beauty from art, knowledge from science, sacredness from religion, prosperity from the economy, virtue from the realm of morality, and order from the body politic. Sideshows are comprised of all components provided by and procured from societal realms other than the societal realm in question. The high point of the European Middle Ages presented a single solid and compassionate religious main show. The realm of religion had, at that time, merged with the realm of morality, and was, in addition, strong enough to incorporate the science of those days. Strict requirements of obedience, charity, fasting, pilgrimages, and participation in the sacraments were the order of the day. Furthermore, the sideshows of the polity and economy provided the Roman Catholic religion with protection and norm enforcement, and provided solutions to the needs of nourishment and drink, clothing and shelter, new experiences and entertainment. In a modern society, the money of the economy provides a most appreciated, embedded alien element, or sideshow, within polity, science, art, and religion. In the main, government institutions create and maintain order, not wealth. However, political activity requires money, and must always tax the enterprises and individuals that generate money. Politicians also need information, so they commission inquiries in which experts and scientists participate. Their buildings and offices need architects and designers with a sense of esthetics. Political life also benefits in legitimacy when it receives the blessings of religious leaders. Note, however, that this does not mean that business, science, art, and religion can be reduced to politics, as many believe. We have not returned to a mediaeval unitary culture with one societal realm in main charge. If all societal realms were “born equal”, i.e. were equally crucial for society, and if each borrowed an equal amount from each of the others, we would have a Pareto optimum in which no realm can be made better off by making another realm worse off. This condition is illustrated here. A Pareto Optimum of Sideshows of Embedded Functions (small flowers) from Each Societal Realm. It is worthwhile for any historian and social scientist to observe and record deviations from Pareto optima. Sideshows are beneficial only so long as they remain sideshows. A main threat to a society, and particularly a many-splendored society, is that a sideshow takes over a main show. This is not a rare event, and it may lead, ultimately, to a full merger of two or more societal realms. At present, we must watch out for the undue expansion of both the body politic and of the economy. For example, when an entire society becomes dependent on banks, certain banks may become “too big to fail.” In the beginning of the twenty-first century, the banks in capitalist countries could hold the rest of society at ransom. Consequently, the regulation of the banks became both a desired, as well as a resisted, policy. In a money-based society, economic sideshows are staged everywhere. After all, everybody, not only those who work in the economy proper, needs money to survive. In this type of society, bankers are alien showmen in, virtually, all non-economic societal realms. The economic sideshows have, in recent decades, taken over many of the unique means by which other societal realms conduct their own activities. Let us here just glimpse at the body politic and its particular economic side shows. Major aspects of military activities have been outsourced to logistics firms. A lot of police work concerning security has been outsourced to firms providing guards, for example, at government facilities, airports, sport events, et cetera. The economic sideshows of government bureaucracies charged with regulatory tasks, such as inspecting anything from automobiles to nuclear power plants, have pushed these agencies to outsource parts, or all, of their official activities to private firms and consultancies. The public telephone services in Europe have become listed companies. Post offices go the same way. Mandatory elementary schooling in the United States has increasingly been outsourced to charter schools. In welfare states, health services are increasingly outsourced, or if they remain public, they are administered by buy-and-sell systems copied from business, the so-called, New Public Management (NPM) . Much of the above has been corrections of previous excesses committed by an overly ambitious public sector. The sad prospect now is a change in the hard-won way of states to treat its subjects as citizens, i.e. individuals with rights. In modern times, the ever-present economic sideshows in the advanced states treat, more or less insidiously, citizens as customers. Unfortunately, a democratic constitution does not, by itself, guarantee Pareto optimality, and cannot stop delegation of state activities to the realm of the economy without commercialization of citizenship.